Files can be shared among Windows, Mac, and Linux plus mobile platforms: iOS, Android, and Blackberry. IT managers can control Dropbox traffic by establishing BizNAS as the sole Dropbox access point inside the corporate firewall. 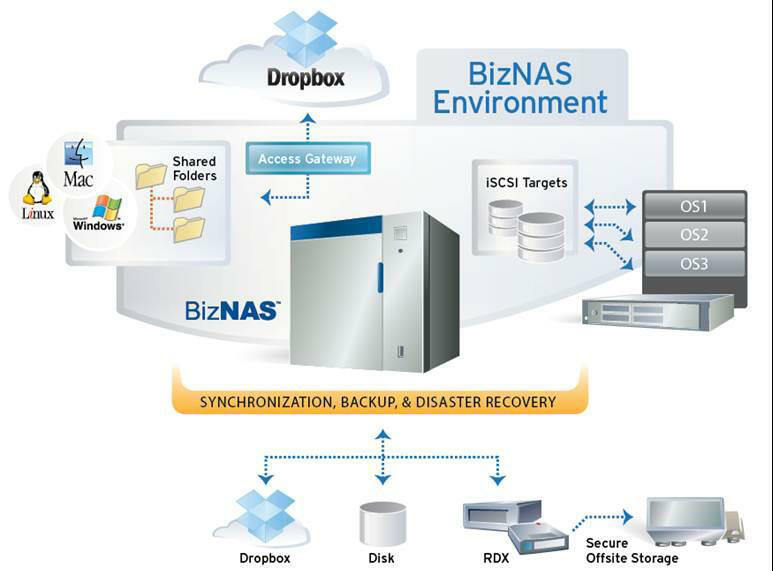 As a safeguard against unavailability or compromised data, BizNAS can automatically and economically back up Dropbox data without impacting Dropbox storage quotas. - Backups can be stored on any of the following: the BizNAS, externally-attached disk, network disk including another BizNAS, or an optional RDX removable disk cartridge for off site/offline disaster recovery. The BizNAS also keeps IT personnel aware and in-control by logging Dropbox-related events and issuing real-time alerts.